The Pot Pie referred to in the title is not a style of apple tart but rather a place. A favorite restaurant in the city that does serve wonderful pot pies. It's a small place -- perhaps 10 tables but the food is outstanding and it is a favorite place for lunch. It's near the Plaza, a favorite shopping area. Come Christmas, it's great to shop on the Plaza and lunch on a pot pie at Pot Pie. Foregoing dessert, of course, for you're full from the pot pie. But this trip, I had their fish entree so I definitely COULD have dessert. 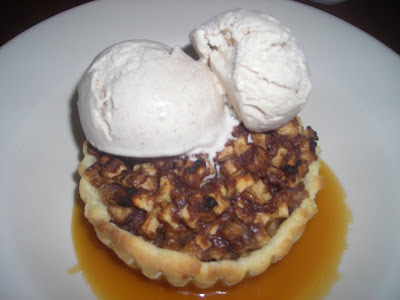 And what better dessert for a fall day than an apple tart with vanilla bean ice cream. 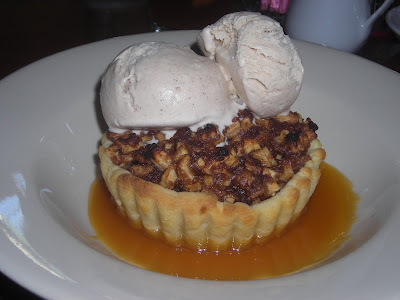 The tart was sitting in a pool of caramel, was warm, and the apples were chopped rather than sliced. I didn't get the recipe but I'm sure I could recreate this tart at home. It is a lovely fall or winer dessert.